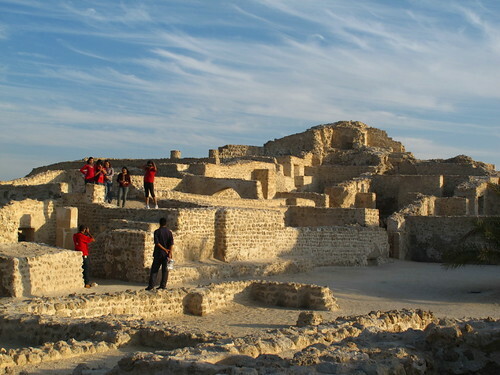 Sweet water bubbling up from the ocean depths has prompted continual settlements on the island of Bahrain for over 4,000 years, coupled with its being strategically located on ancient sea trade routes. For many centuries Bahrain’s pearl diving industry was the backbone of its economy, which since the early 20th century has been replaced by the riches of oil. It is interestingly one of a handful of countries with an ever increasing landmass. Comparisons from a 1960’s map and one from today show Bahrain as the winner for reclaimed land. Another mega-project is currently being promoted for local and world-wide investors. A 4km by 3km area of reclaimed land will rise out of the sea and morph into a city (complete with apartment buildings, hotels, shopping, schools and a hospital) off the north coast of Manama, the capital. Just when we thought the array of sky-scrapers of the Gulf countries could not hold any architectural surprises, from the window of our room at the Fareeda Palace Hotel our eyes zeroed in on two 50-storey towers that were partially sustained by three gigantic wind turbines suspended between them. This anomaly turned out to be the World Trade Centre. The upscale Moda Fashion Mall covers the whole first level, which to our delight had great cappuccino cafes. 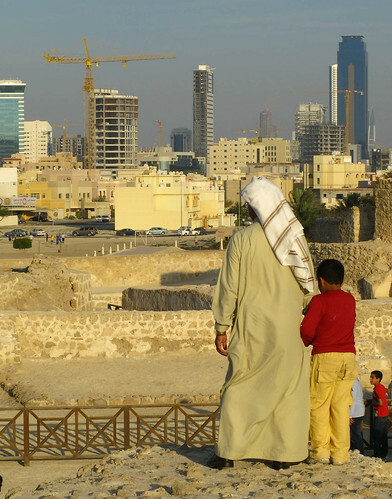 During our first few days in Manama, we made three trips to the Saudi Arabia Embassy. Our intent was to obtain a visa to visit Riyadh, which turned out a NO-GO. The Saudi’s are adamant to keep out western influence, and keeping tourists out is one way of doing this. A great number of expats work in Saudi, but there is more control over those with work visas, as the authorities can go after the company for any rule-breaking behaviour. 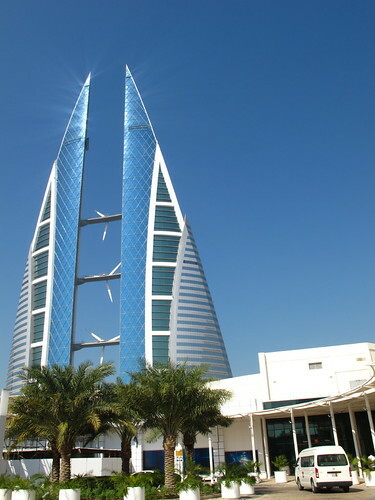 It was time to concentrate fully on the sites of Bahrain. I was in anthropological heaven at the National Museum, learning that there are over 85,000 burial mounds on this small island from the ancient Dilmun and Tylos civilizations that flourished between 2,800 BC and 630 AD. 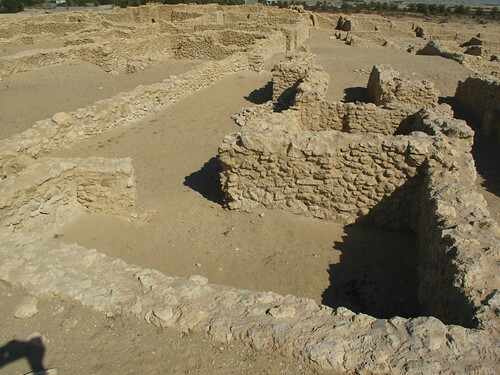 The Dilmun civilizations were divided into early, middle and late periods, followed by a Greek influenced Tylos, the categories determined by burial methods. 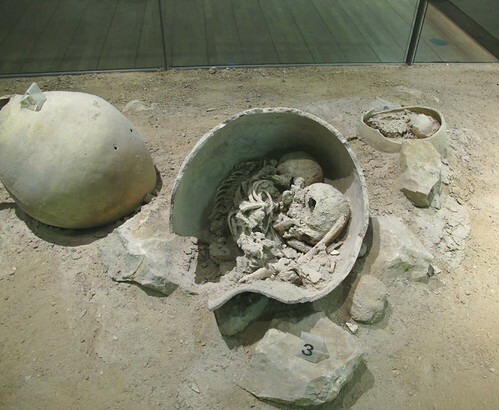 The methods ranged from mass graves, to clay jars used as funerary vessels, to individual graves of clay coffins surrounded by stone casings. Studies of the excavated teeth and bones using the sophisticated technique of S.E.M. (Scanning Electron Microscopy) revealed information on the diet and diseases of these ancients. Other sections of the museum were filled with vivid displays portraying the traditions of Islam, crafts such as weaving and pottery, as well as the techniques of the once flourishing pearl diving industry. Rick, not a museum aficionado, thought the best part was going to the museum café for a cappuccino and almond muffin. While we were sipping and munching an entourage descended upon the café to discuss the procedure for Hilary Rodham Clinton’s visit to the museum (which explained workers feverously hammering platform pieces together and setting up a speaker system in one of the display rooms). Hilary was to be part of a 600 person delegation for a Major Conference on Middle East Security, at the invite of Bahrain’s popular King, His Majesty King Sheihk Hamad bin Isa al-Khalifa. What’s with all these dignitaries following us? It was Tom Cruise in Dubai, Queen Elizabeth in Oman, and now the US Secretary of State in Bahrain. off to see an excavation site. This meant taking a bus to Sar, a town 25 minutes from Manama, for 200 fils (or 54 cents). From where the bus dropped us off it was still another 5 km to the site. We negotiated a price of 3 BD (Bahrain Dinar, about $8.00 CDN) with a swarthy elderly taxi driver, and hopped into his rickety vehicle for a round trip. The small dusty site was a maze of stone walls that once held the bones of the ancients circa 2,300 BC, and though the human remains found had been removed, it still seemed like walking on hallowed ground. Our return vehicle to Manama turned out to be a mini-bus, instead of a full-sized bus as on our way out. It was already packed with about 30 men when we got on. Thedriver shouted something in Arabic, and the front window seat was vacated for“me”. The front seats of buses in all Muslim countries are reserved for women –gotta love it! Rick had to stand until finally the fold-up seat next to me was available. It was then necessary for him to get up at every stop and laboriously flip this rusty-hinged seat to the side to allow passengers from behind to exit the bus. Back at the station we got on yet another bus for the Bahrain Fort (Qal’at Al-Bahrain). At the closest stop to the fort the driver pointed out the direction to walk the remaining distance. We were soon lost in a maze of residential streets – with no sign of anything resembling a fort. Time to ask for directions. A distinguished middle-aged man was standing beside his Lexus 4×4, and talking on his cell. It was impossible not to notice his exquisite diamond ring, and his Rolex as he flipped his phone closed. He promptly held out his hand and said, “I can tell you need help.” When he heard “Bahrain Fort” he opened his vehicle door with a welcoming sweep of his hand, and said, “I will take you.” – which he did. Before parting he gave us his phone number and told us to call him if he could assist us in any other way while visiting his city. 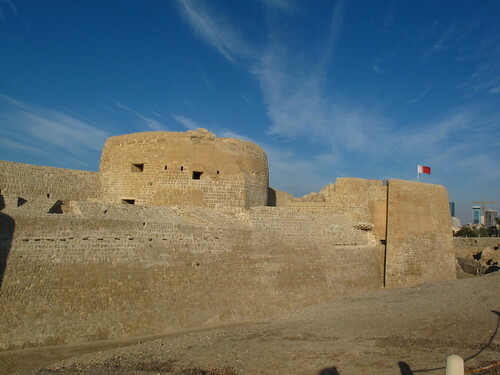 The Bahrain Fort stood like a massive sentinel facing the Gulf. Built by the Portuguese during their occupation in the 16th century, it is one of their most extensive forts with watch towers, artillery rooms with vents in the top to allow the cannon smoke to dissipate, arched pathways joining courtyards, rooms for various uses, even one to press dates into juices and date honey. The Portuguese were ousted by the Persians in 1602, who then abandoned it in the 17th century, whereupon the sands of time left only a bit of the outer fort walls exposed. It took 50 years of digging to bring forth what we were seeing today. And this is only the tip of this most important archaeological discovery, named a UNESCO site in 2005 – as it was found that the fort rested atop a series of cities, built one on top of another, which archaeologists refer to as “statigraphy”, bringing thousands of years of history to life. As we walked along the outside of the fort walls, where archaeologists had peeled away the layers of the ancient societies, our imaginations soared. The oldest civilization to make their home here was circa 2,200 BC. The differences in construction and design were evident from one layer to the next, and at times a new society made use of some of the walls of a previous one. A fascinating walk thru the millennia. A young lady pulled up beside us in a Toyota Camry as we were leaving the fort and asked if she could take us wherever we were going. Finding out we were on our way back to our hotel, she said she would be honoured if we would allow her and her mother to drive us. Hana and her mom Shika looked elegant in their abeyyas and hejabs (black robes and head-coverings). They were out cruising together, as they did every Friday, and today their treat was the museum. Hana offered to take us to any other sites we wanted to see before taking us back to our hotel, and when we declined, she left us with her cell number, inviting us to call her for any other need we may have. We were once again left overwhelmed with the kindness being shown to us. One morning on our quest to find the Post Office, we inadvertently came across the Manama Souq (market), a warren of narrow streets in the old centre, so decided to check it out. About 5 city blocks in, three big strapping men came up to us. They were from different parts of the US; specifically New York, Virginia and Chicago. They mentioned wanting to go to various places in and around the city, and wanted to know if we thought it was safe to walk. “Totally safe,” was our response. We found it ironic but understandable that three fellows who looked like ads for steroids should feel unsafe while we seniors had walked the streets from one end of the city to the other. Our Canadian friends expressed similar concerns; when finding out we were going to several Arab countries, they asked, “Aren’t you afraid?” We assured them that we knew many travellers that came back from these countries with nothing but praise in every respect, including safety. And now from our own experiences, on a scale of 1 to 10, we rate these countries 9.5 for personal safety (if you don’t count the insane traffic, and lack of pedestrian crosswalks). The generosity and hospitality we have been shown again and again just reaffirms our stance of how in the media reports, only hearing of the vile actions of terrorists taints our perception and judgement of these beautiful cultures, and of the great damage these radicals bring to the whole of Islam and Muslim peoples. Our travels are spinning by faster than our blogs are forthcoming. We are now in Syria, and bid you to keep watch for our adventures here.